And speaking of cavemen, let’s have a little fun before we talk body composition, which can sometimes be a downer. Click this link (above) and it’ll take you to a quick 8 question quiz that’ll start your day out with a laugh. The blog, Pay Now Live Later, was a great read, but hasn’t been active for a few years. BODY COMP VS. BODY MASS INDEX (BMI) – what a joke! Ok, time to get serious. There is a lot to say about Body Composition, but let’s stick to the basics, debunk a few myths and then offer up some suggestions for improving body composition. Body composition is different from BMI or Body Mass Index – but these are the two most commonly used measures of “body fat” used today. Body composition is pretty well accepted as the norm in determining health and fitness related to the amount of body fat you carry compared to lean body mass. BMI simply takes a person’s weight in kilograms divided by their height in meters (squared). I hope you can quickly pick out the problem here. BMI came about in the 1800’s believe it or not, and was made popular during Ancel Keys Fat Focus in the 70’s and 80’s. It’s still used in doctors offices today as a quick way to measure for obesity. What a bummer, huh? Let’s take Mouth as an example: He’s 5’8″ or 1.72 meters (yep, had to Google the conversion), and 180 lbs or 81.8 kg (but I knew that conversion, thanks to CF!). His resultant score is 27.63. But of course the CDC and NHBLI dumb it down so we don’t NEED to use our brains and calculate the math, as evidence in the cute little color chart they provide below. 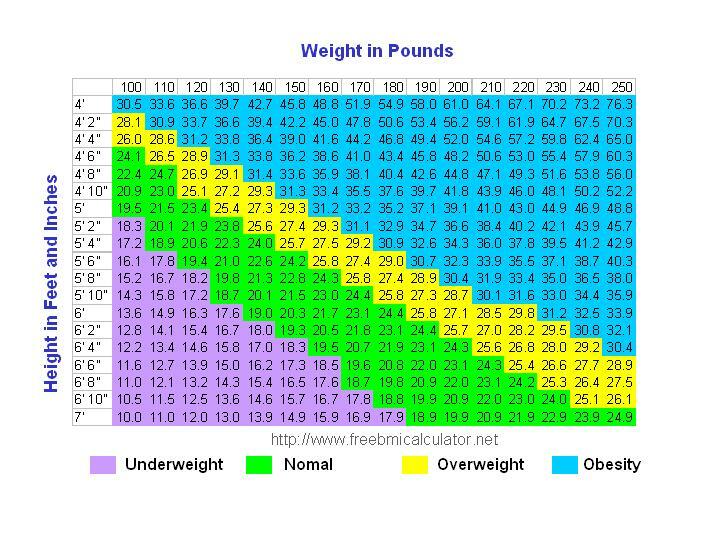 Using BMI, Ed ranks in the “overweight” category according to this measurement. HARDLY! Body composition uses skinfold calipers to measure the amount of subcutaneous fat in 3, 7, or 12 sites on your body. At Rebel, like with everything, we try to do things top notch! First, after Sam’s BioSignature cert in April of 2012 – out of sheer shame being the only one in the class without “Harpenden Calipers”, we invested in the $380 device! And after reviews, it was a good decision. It’s a quality instrument. Second, pinching. Many of you have been bruised….I mean pinched by one of us. We migrated to Poliquin’s style of pinching after reviewing results of this style against hydrostatic weighing and DEXA. And compared to the typical ACE, ACSM, NSCA methods, Poliquin won hands down. Third, we use a 7 site test – anticipating offering the 12 site BioSignature sometime next year. 7 sites is more accurate than 3, and 12 more accurate than 7, but 7 provides us with a great deal of data from which to calculate your body composition. Fourth, experience. Sam’s been pinching for 7 years now and Nicole has been pinching for 5 years! Lastly, interpretation and action on the results. For some of you, we’re able to use the concepts of pinch site in relation to hormone level to help determine how we might be able to affect a specific area. It’s pretty cool stuff, but too much to go into here and better left on an individual basis. So back to Mouth. Mouth’s bodyfat is around 15%. Body Composition is basically the measurement of the amount of subcutaneous fat a person has compared the rest of their body mass. See below, as this classifies him, using a true percentage body fat, at an “Athletic”/”Fitness” Level. Though there are no universally recognized standards for body fat, we use ACE because they’re the most specific and generally understandable by both the fitness industry and the general public. What what’s the big deal? Why do we care…we just care that we look good naked, right? Yes…but aside from the health implications of high body composition, you can be “skinny”, “small”, “normal”, and still look “soft” naked…still be “fat”. The term skinny fat works here. The Mayo Clinic actually calls it “normal weight obesity” due to findings where average looking people, when tested, had higher body fat to muscle ratios than others with lower body fat at the same weight. These normal weight obesity patients had higher incidences of heart disease and metabolic diseases as well! And here’s an image to help get a visual for where you might want your ideal body fat percentages to be. Other than for vanity, why else should we be concerned about body composition? Our health, that’s why. And that should be our number one reason for wanting to keep it within a normal range. I think I can tackle this one in bullets! Special note with us just ending October and Breast Cancer Awareness Month – 80% of breast cancers are estrogen fed. They’re stimulated and “grown” by estrogen. Fat cells produce estrogen. You do the math. …….I know, you get it already! Need I say more? I’d rather be CrossFitting than at the doctor’s office or having procedures, tests, etc. So we’re doing this Paleo Challenge, we’re all feeling better, more alert, more energy, most are losing body fat, some are gaining muscle mass…seems like this Paleo thing is pointing us all in the right direction toward lower to ideal body composition! It’s pretty straight forward. Yes, that donut looks good. No, it won’t help me get to my ideal body comp. This entry was posted on Wednesday, June 22nd, 2016 at 4:30 AM	and is filed under Paleo, RebelHealth. You can follow any responses to this entry through the RSS 2.0 feed. You can leave a response, or trackback from your own site.